Somehow The Weather Channel failed to mention the biggest hurricane to hit Texas since Ike. Maybe it is because this super powerful force of nature blew in from Allentown, Pennsylvania and not from the Gulf Coast. 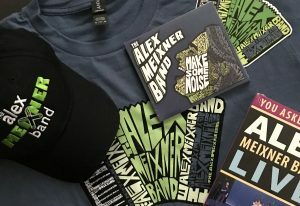 Yes, I said Allentown, PA — the home of one Alex Meixner, arguably the most dynamic, electrifying musical performer working today. If Alex’s energy could be harnessed to an electrical grid, he could power all of Central Texas for a year. 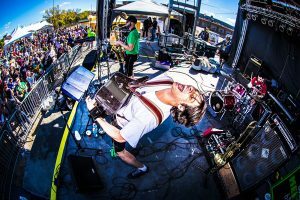 And speaking of Central Texas, that’s just where we most recently saw the Alex Meixner Band perform — at the venerable New Bruanfels Wurstfest, a ten–day celebration consisting of beer and sausage and beer and potato pancakes and beer and kartoffel and, well, you get the idea. Oh yes, and music, too, where every evening as many as three bands play simultaneously in separate musical venues situated within the Wurstfest grounds. That’s a lot of music, but, for ten consecutive years, the one band that packs them in to capacity, performance after performance, has been headlined by Alex Meixner. Step aside Whitesnake, Metalica and Twisted Sister — Alex possesses a stage presence and exuberance and kinetic energy that makes you guys look lame and tame in comparison. Lederhosen never looked so hip. 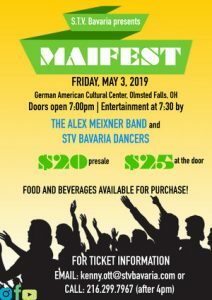 Backed this year by three highly talented accomplices, the Alex Meixner Band set a new standard for fun, zaniness, musicality and perspiration. Phalanges flew faster than a hummingbird’s wings when Alex literally attacked his button box while belting out a truly eclectic array of unexpected tunes, all with a “Meixnerian” slant that had everyone, including the usually sedate fans of Lawrence Welk Champagne–style Music, cheering wildly and forming Conga lines as long and spirited as any during Carnival in Rio. Examples of Meixnerian “Loony Tunes” include “The Devil Goes To Munich,” an exhilarating adaptation that Charlie Daniels must surely salute along with that other Daniels fellow, Jack. Or how about Sachmo’s “When The Saints Come Marching In,” featuring Alex’s amazing vocals successfully emulating America’s beloved Ambassador of Good Will. Or Iron Butterfly’s “In–A–Gadda–Da–Vida,” where Alex is accompanied by one of the band members playing a Ukulele — a dad gum Ukulele! Want another example? How about Wild Cherry’s “Play That Funky Music, White Boy,” a groovy, irrepressible rendition performed on a Siwa & Figli accordion. Just when we thought it was about over….. This sure has been a crazy Oktoberfest season…. For those of you, who have recently just found me or know me from any of my other musical incarnations or educational endeavors—I know the oktoberfest stuff might seem overwhelming—but this year especially has been pretty manic… I concluded my 2 week run with the band for Ace in the Hole Productions in Paterson, NJ doing Oktoberfest shows for senior groups during the weekdays. We’re engaged for almost 3 weeks of performances for 09—it’s a real fun time for the audiences and for us. Obviously we tailor the dance sets towards more foxtrots and cha-chas than Jimmy Buffet and Bon Jovi J — which allows us to showcase Matt Tolentino’s exquisite talents as a vocal stylist on those real old time tunes. After some private parties, the band returned to Stoudt’s Brewery in Adamstown, PA. Again—it’s so much fun to play there— Ed and Carol and their staff have extended great hospitality to our band. The packed house really responded well to the variety of traditional Oktoberfest tunes and Rocktoberfest medleys—but I would be remiss if I didn’t credit the showstoppers of the day— 1) Ed’s vocal premier with the Alex Meixner Band doing his rendition of “What a Wonderful World”— I was completely impressed! 2) Ed and Carol’s grandson marching around the dance floor with a baritone horn— I think we’re going to add him on soon to the band!! In both cases—this is what YouTube was created for…. I hope someone caught the moments! Speaking of catching the moments— I have completely dropped the ball on getting photos up here…. It’s kinda difficult to take pictures when I’m in the midst of performing—and I never seem to remember to bring a camera for someone else to use. SO— if you happen to have pictures from any of the gigs, feel free to e-mail them over to me so we can post them…. Anyway— it’s only been open for about a month and the owners decided to have an Oktoberfest last night. Bratwurst, Beer, and a projection screen showing The Sound of Music and Beer Fest in a great room set the stage for Alex Meixner vs. Matt Zebroski duel— oh, I mean Duo. It was a lot of fun and was well received by the crowd… in fact, we hope to be coming back on a regular basis through the year— keep an eye on the websites for further info…..
A few more private parties this week before the final home Oktoberfest for 2008 at Bear Creek Mountain in Macungie, PA. 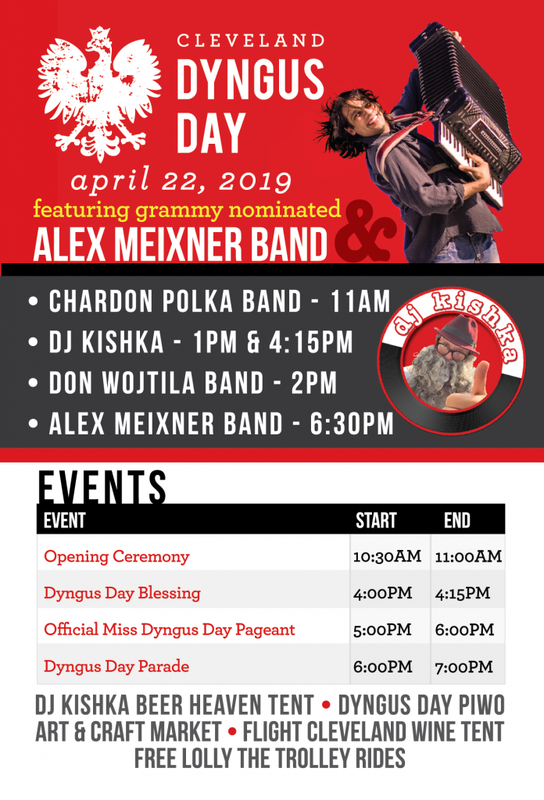 The Alex Meixner Band will be playing from 12-2:30, then the UGH Schuplattlers and The Adlers will be performing as well…. (besides that, Mike Fortunato—my great friend and reed player extraordinaire will be turning 30 on Sunday!! ) From there it’s on to wurstfest!!! !